Allegro’s RomXOAP AE development toolkit offers design engineers a comprehensive solution for building connectivity between embedded designs and enterprise IT environments utilizing standards-based SOAP technology. Embedded devices enabled with SOAP technology are essential for enterprise IT in remote data collection, operations, industrial automation, sensor networks and monitoring applications. Designed for use in demanding embedded environments, RomXOAP AE provides a lightweight SOAP technology without carrying the overhead of general purpose solutions. When designing embedded systems, it is smart to leverage standards-based communication technology especially when devices are deployed globally. Often communications standards have benefited from global participation during development and enjoy an installed base already deployed in many markets around the world. SOAP holds true to this paradigm. Enterprise IT environments worldwide are implementing SOAP-based services to meet the ever-changing demands of corporations striving to compete in global markets. 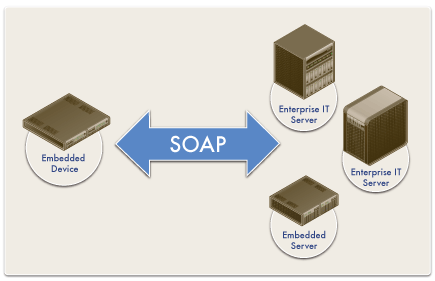 RomXOAP AE enables your embedded device to fully integrate into these enterprise IT environments by offering SOAP 1.1 and 1.2 compatibilities. The primary requirement for embedded SOAP technology is to efficiently translate data between SOAP messaging syntax and internal storage (typically a C structure). However, implementing general purpose SOAP technology in an embedded environment will likely prove to be impractical. Allegro’s RomXOAP AE toolkit provides a lightweight translation between pre-defined C-language structures and SOAP-based messaging representations. RomXOAP AE leverages the capabilities of RomXML AE in addition to RomPager AE for serving pages or RomWebClient AE allowing an embedded device to reach out to any server. As part of the RomXOAP AE toolkit, the SoapBuilder compiler further decreases your development effort when utilizing SOAP in your embedded design. 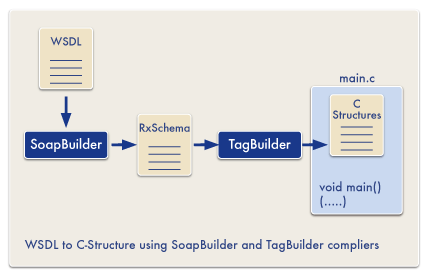 The SoapBuilder compiler takes WSDL 1.1 files as input and generates RxSchema that define the SOAP transactions. The RomXML AE TagBuilder compiler, in turn, uses the RxSchema to define XML objects in C-language structures used for XML-based data exchange. The RomXOAP AE runtime is delivered in ANSI-C, is highly portable and offers a rich API for your development team to handle SOAP transactions. RomXOAP AE can be used stand-alone or together with Allegro’s Secure IoT Suite.